Remember when we went to Napa and had the most amazing panfried chickpeas, and I insisted on going home and recreating them? I haven't forgotten about them, and it was that memory that drew me to Cooking Light's recipe for these Fried Chickpea Sandwiches with Arugula and Mint Tzatziki. This recipe wisely has you "fry" the chickpeas on the stovetop in oil before tossing them with the spices in a separate bowl. I think I need to go back and retry this method with my own chickpeas because I felt like the spices adhered much better to the chickpeas, maximizing their flavor! As we move away from winter, I'm drawn to lighter meals like sandwiches and salads. This delivers just that, and takes all of thirty minutes to prepare! This was the first post-vacation meal I made after our trip to Texas and it was just the thing to help me ease back into the kitchen while still providing a nutritious dinner (much needed after multiple days of cocktails and excessive amounts of chips and guac!). 1. Preheat oven to 350F. Wrap pitas in foil and bake for 10 minutes, or until warmed through. 2. In a small bowl, mix the yogurt, mint, lime juice, 1/8 tsp salt, garlic, and cucumber. Refrigerate until ready to serve. 3. Pat rinsed chickpeas dry with paper towels. Heat a large skillet over medium-high heat. Add 2 tbsp of oil to the pain and swirl to coat. Add the chickpeas and saute for 10 minutes or until lightly browned and beginning to crisp. 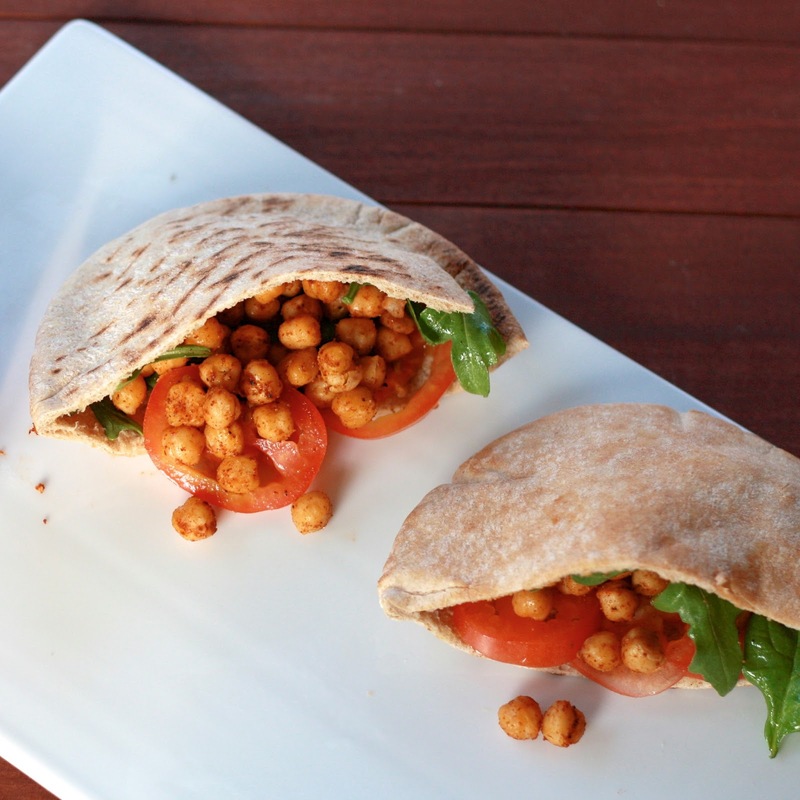 Remove chickpeas with a slotted spoon and drain on paper towels. 4. 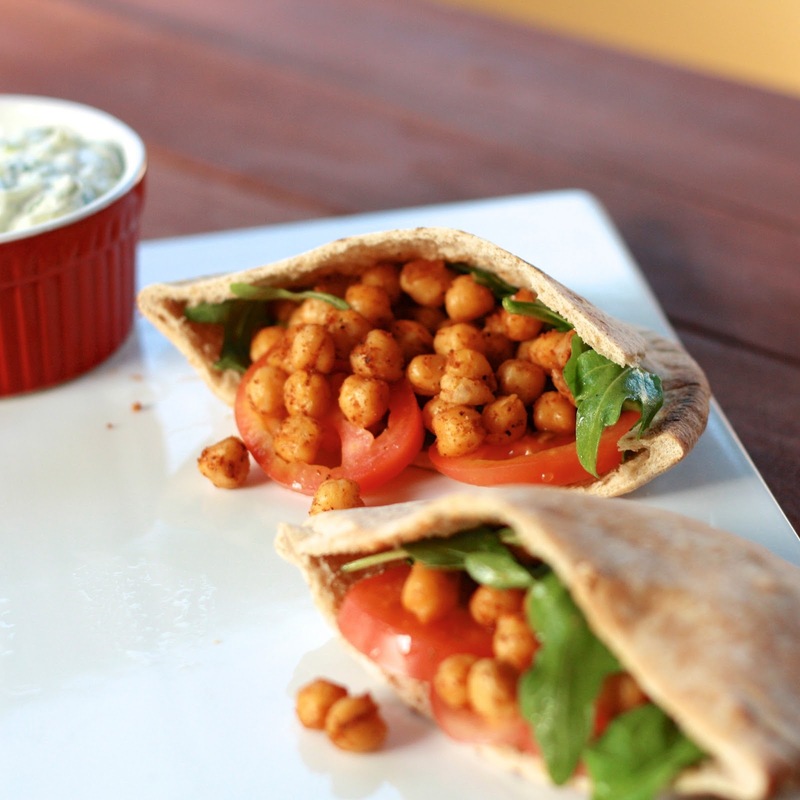 In a large bowl, combine the chickpeas with the remaining 1/2 tsp salt, cumin, paprika, and red pepper. Toss well to coat chickpeas with the spices. 5. Combine the remaining 1 tbsp olive oil with the lemon juice and black pepper in a small bowl, stirring to combine. Add arugula and toss gently to coat. Pour arugula mixture over chickpea mixture and stir to combine. 6. Fill halved pitas with 2/3 cup chickpea mixture, 1 tomato slice, and 2 tablespoons of sauce. Serve immediately.